On August 30th, in the harbor town of Excelsior, I was fortunate enough to see a ceremony for an event that has not happened since 1987, the consecration of a new Lodge, specifically Sir Winston Churchill Lodge #351. 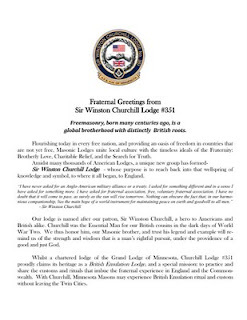 Sir Winston Churchill is a Lodge that will exemplify the British Emulation Rite. It has been developed for the purpose of finding something new for brothers, as its ranks are filled with Past Grand Masters, Past Masters and interested brothers, all there to find a new source of light, wisdom and conviviality. It is only fitting that the brothers chose Churchill as their named patron, who stood up while others stayed silent to defend liberty against the most evil threat to ever arise on this Earth. Churchill knew the dangers of appeasement, the coming onslaught of the totalitarianism, and the descending of the Iron Curtain upon the face of Europe. He proved his mettle through strength of arm, strategic aforethought, and a belief in the rightness in the cause of freedom. Churchill was also a Freemason, having been raised in Studholme Lodge #1591 in 1901. It seems fitting that a Lodge which seeks to exemplify the British Emulation Ritual would choose such a strong personality to emulate and honor. newly installed Master, WB John Gann, and PGM Tom Jackson, a novel approach to Freemasonry has come into fruition in this state. Most Worshipful Brother Tom McCarthy presided over the event and RWB John Cook, RWB Tom Hendrickson and MWB Andy Rice assisted in consecrating the Lodge. Also in attendance were many distinguished brothers from many jurisdictions to see this most important undertaking, including MWB Akram Elias, Past Grand Master of the Grand Lodge of the District of Columbia, RWB Alan Tibbets, Deputy District Grand Master of the Grand Lodge of Canada in the Province of Ontario, and Worshipful Brother Joseph Howell of Benjamin Franklin Lodge #83, Grand Lodge of Wisconsin. Benjamin Franklin #83 works the British Emulation Rite, following the traditions of English Lodges. As the officers donned their resplendent blue aprons for the first time, I could sense a change. We are no longer a Grand Lodge based around cookie cutter Lodges struggling to regain interest in the Craft but an organization desirous to be as varied as the members who occupy it. 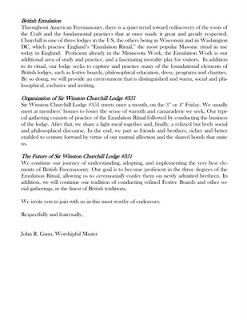 I am thankful to see Lodges trying new things like Saint Paul #3 using a Traditional Observance model, or Sir Winston Churchill Lodge #351 exemplifying the British Emulation Rite. This should be the model, Lodges should find a niche, and they should try new things. After the installation of WB John Gann as Master and the other elected and appointed officers of Sir Winston Churchill Lodge #351, we began our processional lead by bagpipers to the Irish Pub across the street. I know what you're thinking, “an English-style Lodge meeting in an Irish pub?” Yet, I am happy to report that this Festive Board felt right at home in the dark, Walnut-paneled pub. In the pub, we were all able to share a meal and toasts using the traditional English style. MWB Elias gave an impressive speech on where our Fraternity is and where it will be going, which was fitting as the brothers of Sir Winston Churchill embark on new territory in Minnesota Masonry. As we gave our final toast and sang our final song, I witnessed, in that dark, pub basement, the refulgent eyes of these brothers, their excitement and zeal casting a brilliant glow throughout the room. I have been informed by Most Worshipful Tom that if you are interested in attending Sir Winston Churchill #351, you can contact the Lodge Secretary, Frank Harris, at fharris (at) usinternet (dot) com or Most Worshipful Brother Tom at tom (at) pro-activemktg (dot) com. If you live in or are visiting the Minneapolis area, you should really check out this fascinating Lodge experience. I have decided to republish a great comment to my post, Be Prepared, Not Afraid, by Worshipful Brother David Wells of Virginia. He is a Past Master of Taylor Lodge #23 of the Grand Lodge of Virginia. Worshipful Brother Wells has presented great answers to questions that may soon be posed to each one of us. No, we have members in our lodges locally, regionally or statewide who are Christian, Jewish & Catholic just to name a few. Our fraternity only requires a belief in God. I am a member of my lodge for fraternal fellowship & brotherhood; to explore how to make myself and others a better man by studying our Masonic ritual and exploring from an educational perspective what our symbols represent. I attend my church, temple or synagogue for a greater understand and search for my personal salvation. My salvation and grace come from my personal relationship I work on with God, my fraternal fellowship with brother Masons. WB David would also like to share with you his Twitter account if you would like to follow him: @DavidWellsVA Thank you WB David again for this great response. It was timely and good. Now that we have seen the novel from Dan Brown, it's the time to get ourselves into action. The Relevant Mason has posted a great article about what we need to do entitled, "Dan Brown Got it Right". Thanks to brother Porter for his great article. #MQW (via @nickjohnson) Have you ever served as an officer in your Lodge? What and when? The Antiques column in the Arts Section of the New York Times has written an article entitled, Masonic Lodges Open Those Mysterious Doors. The article focuses on our great treasures that Grand Lodges are revealing to the public and the renovations that are currently ongoing on our treasured halls. As an avid reader of the Times (which I consider the paper of record for the USA), I was hopeful but reticent that an article was mentioning our Fraternity. The last two articles of recent Masonic events have been less than pleasant and the obvious agenda behind both articles was focused more on potshots and less on objective facts and subjective policy changes. As the paper reported during the MWB Haas case reported earlier this year, the author of that particular article took direct potshots at Freemasonry as a good ol' boys club focused on silly rituals. The intent on the article was not about a procedural due process concern but rather our restrictions to men only "[a]nd its taste for pompous honorifics and ornate regalia may conjure images of solemn men with arms interlocked: Laurel and Hardy meet Babbitt." The Gate City case was reported fairly but has still caused irrecoverable damage. I don't blame the Times nor Gate City but rather outdated ideas still held by brothers, outdated ideas that I hope will have been officially put to rest by the current edict issued by Grand Master Jennings. We have not received good press from the Times as of late but I was pleasantly surprised to see good news with this article. Our very knowledgable brother, WB Arturo de Hoyos, Grand Archivist of the Scottish Rite of the Southern Jurisdiction, was interviewed about the pieces being shown to the public and the updating and changing of Masonic presentation to our brethren and the public. He did a fantastic job presenting our Craft as well as explaining the need to create a coherent presentation to the public. We can hope that when the "Symbol" storm is upon us, we will receive as kind of press as we received today. #MQW (via RWB Tom, SGW of GL of MN) What in Freemasonry do you value? #MQW (via @tybaltknight) from the g/f: How do you explain masonry to non-mason family & friends?